Why John Mack Matters: Part 2. Marking where we’ve moved since Mack, a look back is in order. Where John’s work ended and our work continues needs to be examined. In this post I’m sharing highlights of what I consider the most important changes in the past decade as they relate to John’s work. 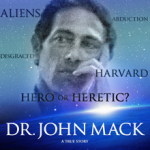 John Mack’s Earth life ended ten years ago. Radical shifts have occurred in the past decade in the fields of ufology, science and religion concerning disclosure of the ET Presence. Marking where we’ve moved since Mack, a look back is in order. Where John’s work ended and our work continues needs to be examined. In this post I’m sharing highlights of what I consider the most important changes in the past decade as they relate to John’s work. John identified the aspect of trauma in working with experiencers. He primarily used diagnostic tests and talk therapy for trauma treatment. Ten years later trauma therapy is next-generation. Traumatologists such as Dr. Robert Scaer provided us with a scientific understanding of how we scar our neural networks when we experience trauma. Did you know your brain may have scars? Pioneering therapies that combine algorithms of spiritual sound and technology such as Brain States Technology are proving effective treatments. Scientists, primarily consciousness scientists, have embraced parapsychology. They are developing scientific theories and experiments with fMRI to measure and understand of our cosmic consciousness and our non-local experience. Psychic intelligence is our precious resource. The most important thing in Exoconsciousness is researching through science and subjective experience that our human species is created, equipped with advanced abilities to experience ET contact—and that this ability is sourced in our consciousness—our exoconsciousness. That means humans have a valuable psychic intelligence. This intelligence will guide our journey into space and create relationships with extraterrestrials. As we see into our universe, we see into ourselves. Cosmic consciousness science opens the mind as cosmologists open space. Edgar Mitchell and Rudy Schild’s research with the quantum hologram and multi-dimensional consciousness, offers us the mathematical structure of who we are and where we live. They are writing a new creation story. With it comes a new belief system. Academia and religion are open platform. Today that platform includes discussions of exobiology, UFOs and ET Contact. From the Library of Congress, to MUFON, to the Vatican to a Boston School of Theology classroom—the focus of the conversation is the ET presence and how we respond.